A lot of people who visit Toronto for personal or business reasons usually take some time off to take a quick tour of Toronto. There are so many places around Toronto to see, if you have te time! Niagara Falls in Ontario province is one such place. If you have a day to spare in your Toronto schedule, think about visiting the beautiful Niagara Falls. It is about a 1.5-hour drive from Toronto. 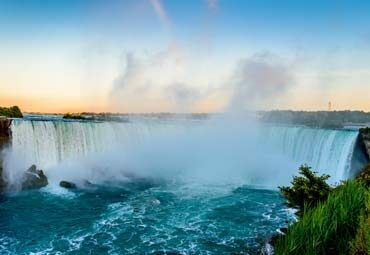 You can see the famed waterfalls and also visit some of the tourist attractions in Niagara Falls, Ontario. The best way to tour Niagara Falls, Ontario, is with a bus tour. It is hassle-free and shows you many more places than you would be able to cover by yourself in a day. 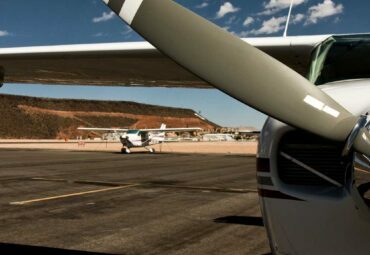 There are day tours, half day tours, and day and evening tours. 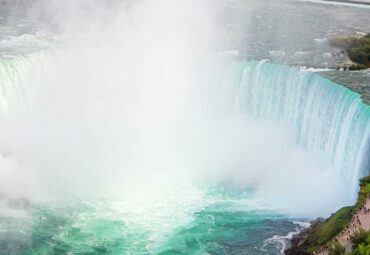 A Niagara Falls Day and Evening Tour from Toronto is the best of all Niagara tours. It gives you a chance to see Niagara Falls at different times of the day. The tour starts from Toronto in the afternoon. 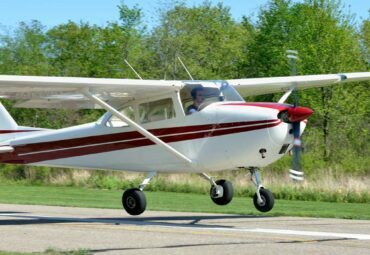 Pickups from some cities in the GTA (Greater Toronto Area) are also offered. 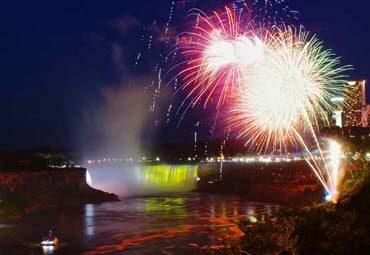 If you visit Niagara Falls between May and October, you can watch the fireworks display over the Falls. Niagara Falls has been visited by famous people from all over the world. From Jerome Bonaparte (Napoleon’s brother) to Marilyn Monroe, Niagara Falls never fails to impress visitors. You can see Niagara Falls from Niagara Parkway, which runs along the Niagara River. It is free to see the Falls. 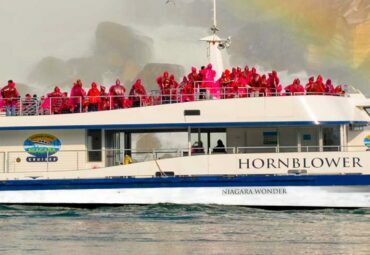 The Hornblower Niagara Cruise is a must-do attraction, which is open only in the summer and fall. This boat ride through Niagara Gorge takes you so close to the Falls, you get drenched from the cascading water. A Niagara day and evening tour also includes a visit to Niagara-on-the-Lake in the evening. Niagara-on-the-Lake is famous for its Victorian-era buildings, vineyards and wineries. You will have time to take a walk around the town to admire the elegant Victorian homes and buildings. Step into the quaint shops on Queen Street. There are boutiques, pubs, eateries, gift shops, etc. Get a behind-the-scenes look at one of Niagara’s award-winning wineries. See how grapes are harvested and converted into premium VQA wines. After the tour, there will be wine sampling. You can even buy some wines and Canada’s famous icewines from the winery. Niagara Falls has a rich heritage. Right from the time it was first discovered, it has had an eventful history. Queenston Heights Park was designated National Heritage Site of Canada in 1968. It stands on the battleground of Queenston Heights, where American and British forces fought against each other during the War of 1812. In the park is located Brock Monument, a 56-metre (185 feet) column dedicated to Major General Sir Isaac Brock, who died in battle here. With a Niagara Falls day and evening tour, you will have the chance to view the Falls after dusk when it is illuminated by coloured lights. For an even better view of the illuminated Falls, you can have dinner at a restaurant overlooking Niagara Falls. Enjoy the view of the light show at the Falls while having dinner. After dinner, you can take a stroll on the pathways near the Falls for a view of the light show. See the Falls change colour every few minutes. On select nights between May and October, the night sky above Niagara Falls comes alive with a fireworks display. The fireworks display usually starts at 10:00 p.m. and is visible from many places in the city. 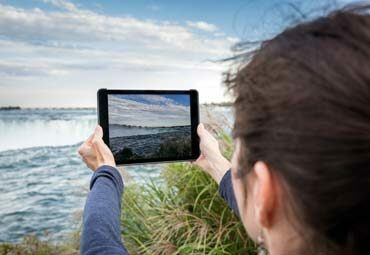 By the end of the tour, you will have experienced the many sides of Niagara Falls, Ontario. 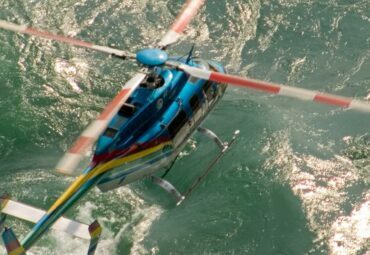 This guided tour takes you to all the natural wonders on the Niagara River such as the Niagara Whirlpool and Rapids. You will also visit sights like Floral Clock, Skylon Tower or Journey behind the Falls (in winter), Clifton Hill and more! You will even have time for some shopping. Niagara Falls day and evening tour from Toronto starts in the afternoon. On fireworks nights, the tour bus starts back from Niagara Falls, Ontario, after the fireworks, i.e. after 10:15 p.m.